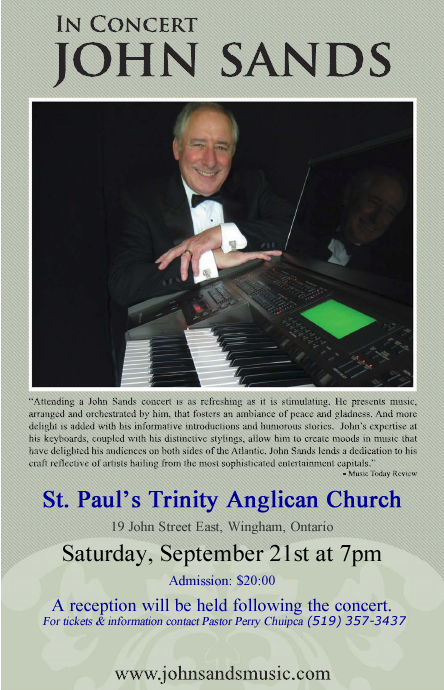 Listed below are three sizes of posters which can be used to promote your upcoming John Sands concert. Each size has four fields or boxes into which you can insert the venue, address, and date and time information. You may need to click on the "Highlight Fields" button in the upper right corner in order to locate the fields. The first three lines are single-line fields of varying size font and color. The fourth field is multi-line for extra information. Please note that the data which is entered in these fields cannot be saved. If you will not be printing the poster yourself, your printing service will need to enter your information before they print the poster. Click on the poster which best meets your requirements. You will then be able to either print the poster if your printer can accommodate the size selected, or save the file for transporting via disk or flash drive to a printing service such as Staples or Office Depot for large format printing. It may also be possible to email the file as an attachment to your printing service. Posters are designed to be printed in colour. Please do not print in black and white.